Inspired by Poe, ghoulish tales, and corporate jargon. I arrived at the House of Jargon on a windy day, overcast, with a steady drizzle of rain. The letter from Roderick Jargon arrived late because he didn’t follow best practices and the large attachment exceeded the size of my mailbox. His words said he had fallen ill trying to synergize members of his house and needed assistance to flesh-out ideas and restore his health. Visible on the outside of the house, was a large crack extending downward to its foundation. I was greeted by Madeline, Jargon’s chief of staff. Her eyes showed she was weary from restless nights. In a trance-like state she murmured, “We’ve been expecting you. We have not been able to herd the cats and Mr. Jargon has fallen ill.” As I entered the foyer, I was awestruck by the size of the house. It was small enough to hide the reasons for underperforming expectations but large enough to hide an elephant in the room. I knew immediately, my visit would test my senses and resolve. The air was stale and smelled of mold, rot, and decay. Madeline escorted me to the studio, where Mr. Jargon sat listless and pale in his chair. “Your painting collection is impressive”, I said as I tried to lighten the mood. “Yes, I have searched the world and found pieces to promote increasing productivity and doing more with less”, he replied. The lights suddenly went out as the rain outside intensified. Madeline lit some candles so we could continue our conversation. Our shadows, now present on the walls and floors, intensified the feelings of doom and despair. A few days later, Mr. Jargon informed me Madeline resigned her job and would leave the house. He insists I help him define an exit strategy for her because she was the nucleus of the team. During Madeline’s last two weeks the mood in the house grew more somber. Any glimmer of hope, excitement, and purpose were lost. Mr. Jargon’s condition continued to worsen and even I felt agitated over trivial things. The mood of despair dampened my spirit. 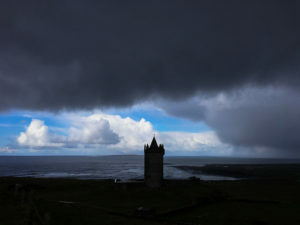 During the fifth week, a large storm moved into the area. Once again, power was lost at the house and we moved about mostly in the dark. Mr. Jargon and I, retreated to his bedroom hoping to find rest and relief from fear of the storm. As we talked, I looked out his window and noticed a faint glow on the lake surrounding lake. But yet, there was no light from the house and the heavens provided no help to see. The house appeared to be alive, casting its own light to those who dwelled within it. Mr. Jargon soon became more delusional and started to recount stories of past successes. He was living in the past while grasping for tomorrow. The knight, empowered by the words and vision, slays the dragon and reaches for the shield. But the shield falls to the ground with a resounding clang. A huge gust of wind pushed the windows open and extinguished our candles. In a faint light from the moon above the house, Mr. Jargon and I noticed Madeline is standing in front of the open bedroom door. She runs to Mr. Jargon and releases a scolding monologue with accusations about missing alignment, collaboration, and buy-in from key stakeholders. I knew my time had come to leave. Frightened by the distrust and accusations, I felt like I would soon be thrown under the bus like so many others in the House of Jargon. I ran for the door, leaving my belongings. Passing through the outer courtyard, I continued to run not wanting to look back. As if on cue, the moon broke free from the clouds and cast a light upon the surrounding wilderness. I stopped to look back upon the house. The crack in the exterior I had noticed when I arrived widened, and soon split the house in two. The house began to sink as if under the heavy weight of non-value added activities. It vanished into the ground and my view was consumed by howling winds and blinding rain, as I lost sight to the House of Jargon. It’s easy to get to a state where the loudest voices get my attention during the week and I lose all sense of priority. Having tasks in multiple places makes it easy to lose them and really difficult to see what is most important. Help! 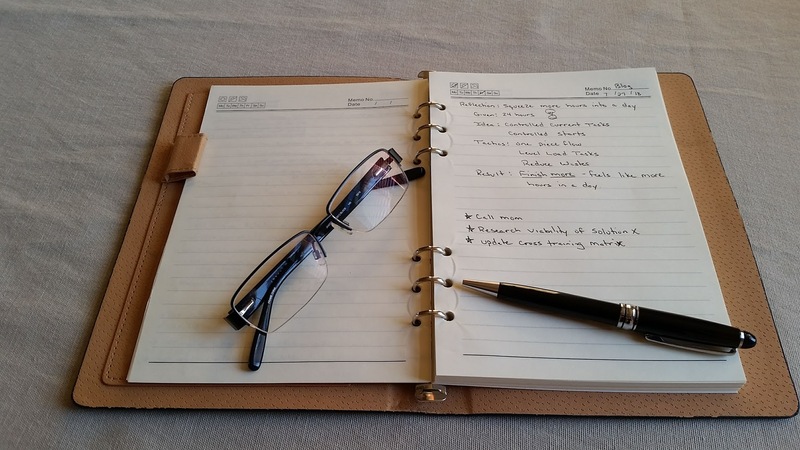 I’ve tried different systems over the years to corral tasks into a reduced number of areas. I try to group personal tasks outside of ticketing systems and email together into one tool. Getting down to one tool is part of a simplification plan that makes managing action items achievable. A single location allows me to group, sort, and prioritize the list. I’ve tried a number of electronic solutions over the years and at times I just use pen and paper. There is a no perfect tool or system. What we choose to use is a personal preference based on how we think, how we mentally organize data, and what we can make part of our routine. Personally, I prefer a tool that puts a task into the context of the larger body of work. I like a task list that is easily searchable. I like a tool that allows me to add notes and related documents to the task. Some action items, like service tickets, are assigned in group workflow tools. These tasks require interaction with the customer/requestor or project manager. Using group workflow tools provides communication back to the requestor and keeps a record of the interaction. Two important attributes for tasks. Communication – Keeping the requestor current with clear communication is the best way to reduce the number of status report inquiries. Visibility – It hurts when I forget about a task. That’s like letting someone down because I forgot about something that is important to them. I need to pick a tool that I will both use and will see through the course of a day. Since I have tasks in both a personal to-do list and group workflow systems, I created an entry in my leader standard work definition so they receive recurring attention. Without some definition of routine our day is ruled by the loudest voices. That’s not productive. The ability to transform any document to PDF format is built in to Windows 10. Just select the print function from your application and choose the built-in printer called “Microsoft Print to PDF”. This will prompt you for the location to the save the PDF. From there you can share or print to paper as needed. 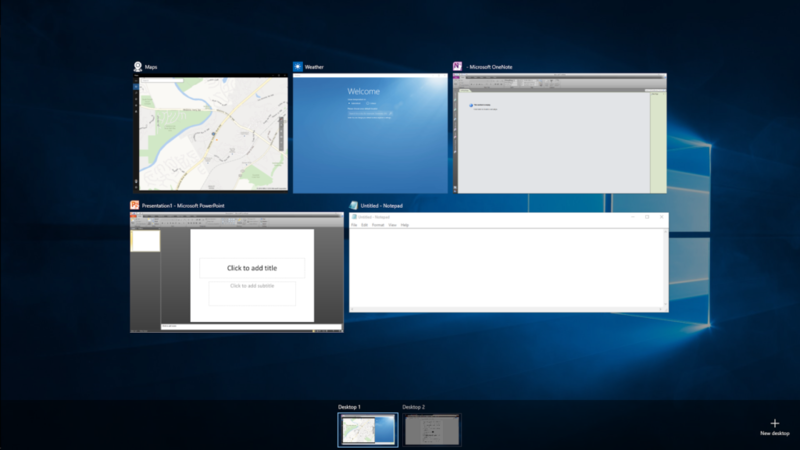 At the bottom of the screen you’ll see desktops in the center and a button to create a new desktop in the right corner. 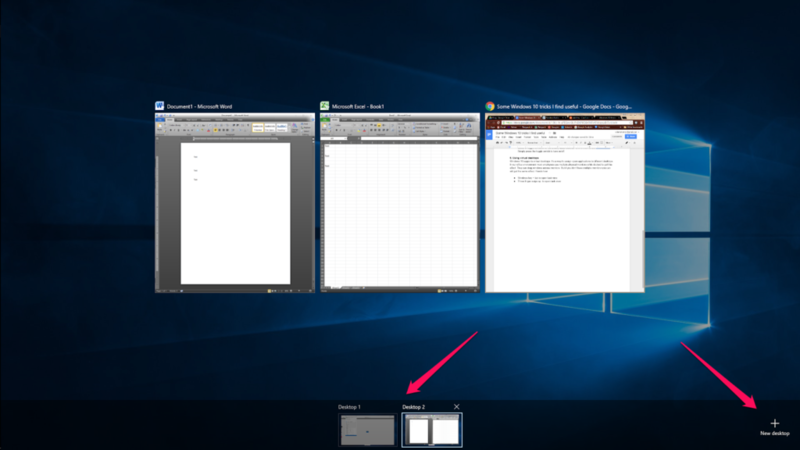 You can drag open windows from the task view into a desktop at the bottom. This could be useful if you have some applications that need to remain open but you don’t want them to clutter the space in your primary working view. There are many ways to scroll up and down on a screen. A nice feature for laptop users with a touchpad is to use two fingers on the touchpad to scroll up and down. There is a physical toggle switch on many laptops. My Dell model has a slide switch on the right-side next to the USB connections. Press this icon in the task bar or select Windows key + A. This will bring up a series of toggle switches for commonly used features. One of them is Wi-Fi . Simply press the toggle switch to turn on/off. Let me know what productivity tips and tricks you have for Windows 10. Open spaces in the office? I’ve started reading Quiet: The Power of Introverts in a World That Can’t Stop Talking by Susan Cain. Part 1 of the book, titled “Extrovert Ideal”, suggests that American society is dominated by those who project, present, and socialize well with large groups. Cain gives examples and shows that extroverts are the people most likely to influence and lead our society. As Cain relates to the business world she touches on the trend over the past decade to tear down cubicle walls and build open spaces. The rationale of business and organizational planners is that open spaces are cheaper to maintain and promote greater team unity and collaboration. Cain argues that these open spaces are not having the desired effect on collaboration and in-fact may hinder it. (She uses the results of numerous studies that I won’t restate here.) One of her main points is that inventors, artists, writers, and engineers need private spaces to create their best work. This is counter to the New Groupthink ideology that teaches creativity comes from open and collaborative places. I searched for other viewpoints on this topic because I have a direct interest in how to lead and motivate groups of people that code (create something) for a living. 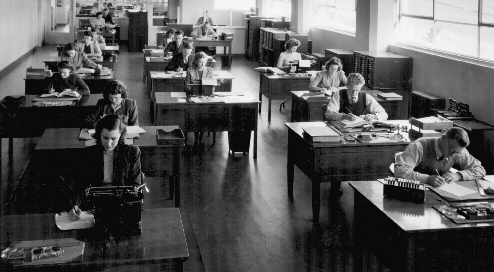 Lindsey Kaufman writes that open offices are detrimental to productivity. I like Kaufman’s viewpoint because she gives first-hand experience of moving to an open office format. One of her main assertions is that productivity suffers as a result of noise distractions. What’s lost is the ability to concentrate on a single task and think uninterrupted for an extended period of time. Should we dump open office spaces? As with most things in life, I feel like office seating arrangements needs to find a balance. There is a case for open seating and group collaboration. There are times when groups do need to come together and share their ideas and work through problems. But there are also times when those who create things for a living need a private space to work their trade. Have a set of offices designated as private spaces around the office. Employees can reserve the spaces as they would a conference room or operate first come-first serve. I expect there would be other logistical items to work-through with this arrangement such as how long the space can be reserved. The study by Knoll shows that the height of walls between stations in an open space has an impact on the productivity of workers. Lower walls open-up collaboration but can also make employees concerned about privacy and added noises. I don’t think completely dumping open office spaces is the best answer. Companies need to develop cultures and that is difficult to do if everyone is always working privately. If you have an opinion on this topic, I’d love to hear from you. I’m particularly interested in first-hand experiences.